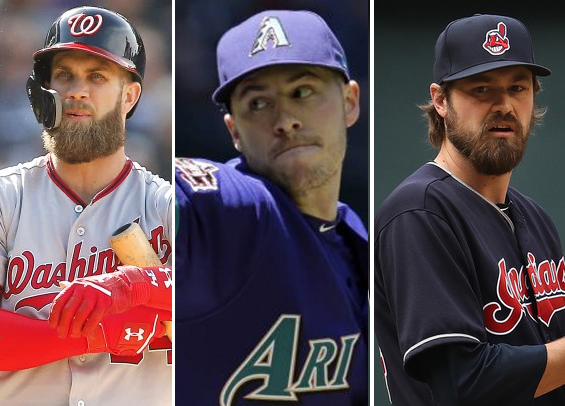 The Phillies are in on Bryce Harper and Manny Machado, hosted Patrick Corbin on Tuesday, and according to multiple reports are linked to Paul Goldschmidt, Madison Bumgarner, and Andrew Miller. The hot stove is cooking, for real right now. There's never been an offseason like this for the Phillies, where they essentially can dictate how things will play out across the rest of baseball. The financial might of the organization, thanks in part to a recent television deal, is on full display. The Phillies have several needs right now, namely adding a legitimate power bat to the middle of the lineup. The club is also looking to add a left-handed starter to the rotation and sure up the back end of the bullpen. Every hour it seems, new rumors erupt on Twitter and spread like wildfire. The fact is though, unlike previous offseasons, almost everything is believable. It's not out of the realm of possibility that the Phillies sign the best available player - regardless of cost - in each of their three areas of need. Signing both, Harper and Machado, to deals? It's unlikely, but the potential is there. Inking Corbin to slide in behind Aaron Nola and Jake Arrieta in the starting rotation? Certainly plausible. Bringing Miller to Philadelphia to hold down the eighth inning? Again, believable. It's all credible at this point, and that's what makes this so much fun right now if you're a fan. "It's not something I've really ever seen," one AL executive recently told the Review. "The Phils are in on almost everybody that's out there and they have the capacity to sign multiple stars. Not just one, but multiple. They are running the show, plain and simple." Expect the rumor mill to pick up even more steam as the Winter Meetings approach.